TaskAssure® caregiving services so you know what's been done! Are you coordinating care for a family member? Or, are you a professional guardian or care manager? In many cases, you rely on people to perform services such as meal preparation, transportation, house chores, and other support tasks, even when you won't be there to watch. Are you concerned if your tasks are performed on time, to your satisfaction, by the people you selected? Are you sure you are getting what you are paying for? What are some example problems TaskAssure solves for people in caregiving situations? See just a few examples below of actual scenarios that you may face today, and how TaskAssure helps. Learn more on our Product page, and find Frequently Asked Questions and Tutorial Videos on our Support page. Did the driver pick up Mr. Jones in time to make his medical examination? Problem: Some tasks are very time sensitive, such as transporting someone to their doctor appointment when they have been recovering at home. Failure to make an appointment can lead to rescheduling fees, and may jeopardize recovery. But the person we assigned could forget to mark the assignment on their schedule, or could be delayed for various reasons. Solution: When you assign a task on TaskAssure, you are certain that your helper has it in the palm of their hand on their mobile phone app. 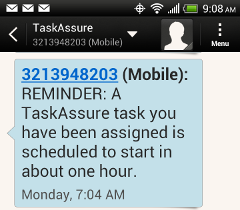 And they will receive a text or email reminder before the task. You will also receive notification when the task starts, or an alert if the task hasn't started during your specified window, giving you plenty of time to make a call to resolve the situation. Has the fitness trainer been able to accompany Dad on his daily bicycle ride? Problem: For some activities, it is important that a length of time, or distance, or other quantity is performed. Such as if we hire someone to exercise with our family member a specified amount each day. Or when we pay for effort by the hour. In these cases we can be concerned about the amount we spend, and also the goal of the activity. 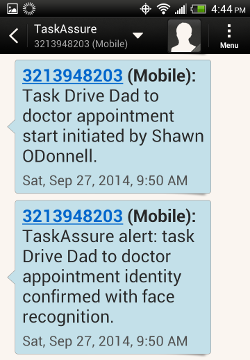 Solution: During each task, TaskAssure monitors the time and location of the person, which can be viewed on the task status page. 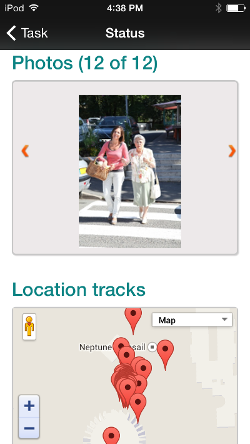 And the helper can easily submit photos with just a couple taps on their mobile phone. These photos are time and location stamped, so you know they are real. You have confidence you are getting what you pay for, as well as gain the peace of mind seeing actual progress. Which providers have performed which tasks this month? Problem: Coordinating care for someone can require multiple service providers. The person they are helping might be confused and unable to provide clear information about tasks that have been provided. It can be challenging to keep track of what tasks we ask them to perform, and when. Solution: TaskAssure gives you a view of all your tasks so that you can see in a moment those that are "Completed" versus "Late". We even detect if we are unable to communicate with a mobile phone during an active task, and can alert you in that event. Your task dashboard also allows you to share task information with others, so you can family informed. TaskAssure Pro Assurance for people managing services for multiple clients! Pro Assurance includes additional management and reporting features to help you handle large numbers of tasks, for multiple clients or properties. 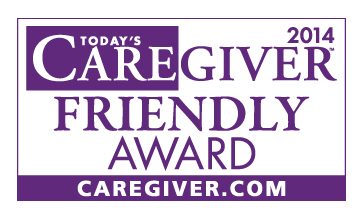 We are proud to announce receiving the 2014 Caregiver Friendly Award.